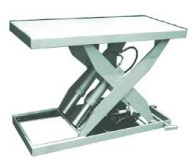 Platform: 96” x 120” smooth plate w/sub frame to accept load cells; base frame 84” x 118”; 23.5” deep solid skirts on 4 sides and removable; lowered 31.5”, travel 84”, and raised 115.5”; motor/pump 208v/3ph/15hp/60 hz. Control: push-button up/down and emergency stop; scissors hollow structural steel tubing; cylinders 3 each piston style w/hydraulic safety velocity fuse; axle pins ground polished and hard chromed steel; pivot points all w/self-lubricating bushings; limit switch tree for 24”, 84”, and 108” all wired to central junction box; maintenance strut; removable lifting lugs; lagging holes; and industrial gray enamel finish. Scale and Display: load cell: capacity set of 4 15,000 lbs each; stainless steel mounting hardware; dual integrated lift-off protection; dual vertical safety stop. Control panel: stainless steel enclosure; one standard serial output; bright 21 mm graphic display and includes mounting bracket.